Not quite fitting in the Sew Cinematic Challenge, that is. So, I'm not doing it but I can always admire the work of those who are inspired by those challenges. When I read about this challenge, I liked it but, given that I'm not much of a film-buff, I could only really think of Mad Men outfits. And as far as body types go, I guess I ought to be in Betty territory (not that I want to be. Betty can be pretty childish and at times annoying. No vixen and queen bee of the work floor like Joan, no up-and-coming girl of the new generation like Peggy...) but her style can be quite ehm... frilly? The one thing I thought about immediately was her riding outfit. And I didn't think anyone else would. Turns out I was wrong. Debi has actually made a great outfit inspired by Betty's riding gear. In fact, she mentioned all kinds of interesting details about the blouses worn with it which I didn't even notice. New trousers from the same pattern as before, this time in a olive/mustard coloured cotton twill. This fabric is both lighter in colour and less drapey that the woolblend I used before, so it tends to show and folds and creases much more clearly. And you know, I have to, eh, be able to move? Thank you all for weighing in on the topic of capes. However... I'm not going to make one right now. I might be able to change that little cape/jacket thing to work for me, but to be honest I'm just not that thrilled about it. Rationally, it is a really good plan to make another piece of outerwear for this intermediate kind of season. On the other hand, I don't really miss an item like that in my wardrobe as it is. Add to that: I'm busy, so I want my sewing to be fun and relaxing. And at this moment, designing, drafting and sewing a cape is not. Yesterday evening, I cut out the fabric for another pair of high waisted, fitted trousers. These will be in cotton twill with a little bit of stretch in a really nice colour which something between mustard and olive. I'd like to get started on sewing them, but I don't have thread in the right colour... Hopefully I'll have time to go out and buy some tomorrow. Other than that... Well, spring is upon us, isn't it? 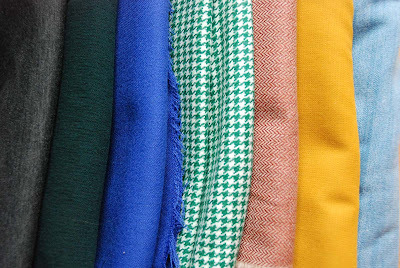 I never got the hang of sewing ahead of the seasons, but now, I've seen enough sunshine to want to indulge in making colourful things for warmer weather. I bet I'm not the only one who's thinking of dresses. 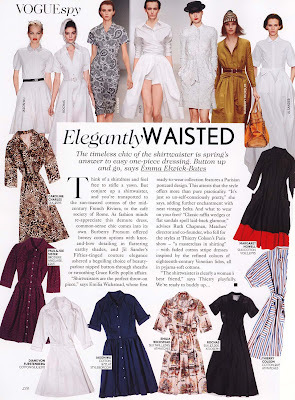 Even ever-sophisticated British Vogue was commenting on this trend in the March issue (I rarely buy glossy magazines, just the occasional 'collections special'): the shirtwaister. They seem to suggest there's some major difference between a 'shirtdress' and a 'shirtwaister'. I may be showing myself here as someone who isn't a native speaker, but... eh... that one escapes me. Vogue itself, quite helpfully, doesn' elaborate on that point. 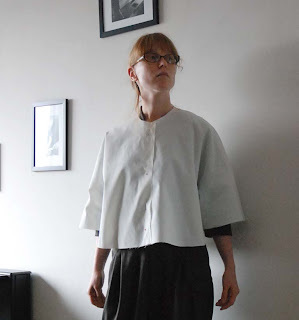 Anyway, I love shirtdresses, especially those with big, full skirts. 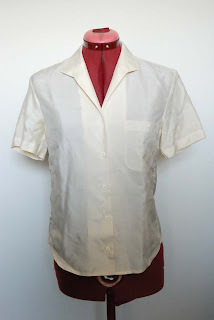 I've drafted several myself and I now have a number for vintage patterns for them as well. Shirtdresses are the kind of dresses you can wear almost anywhere and for any occasion without looking under- or overdressed. 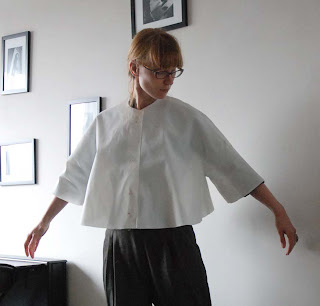 With variations on collars and sleeves, they can be made to flatter a whole range of figures. The changing tides of mainstream fashion couldn't stop me from making at least one more this spring, but it is a happy coincidence that it has, in fact, turned my way. I don't plan on replicating any of these looks, but there is definately inspiration here. How cool is that black dress on the right, with the wide band of bright red at the hem? I'm not even sure that really qualifies as colour blocking but it's a great way to spice up an otherwise 'safe' choice. Oh, and really like that mustard coloured one, top row, second from the right. 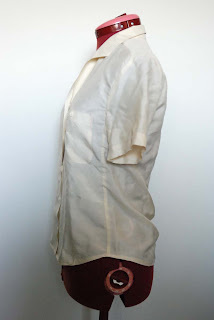 It's completely shaped with tucks and pleats in what looks like a crisp cotton. I'm always a bit hesitant about tucks but this looks really flattering. And, as you know, I love that colour. This is hardly a proper 'what I plan to sew for spring' post, but you know I'm more of a spur-of-the-moment kind of planner. I will be back later to consider issue of dresses for spring more seriously. Do you have any specific sewing plans for the new season? Like many of you suggested, I decided to go with the short cape with sleeves. But, since this little book is new to me and I still wasn't entirely sure about the look, I decided to make a muslin first. It doesn't mention how deep the cut between sleeve and body should be, or at what angle to the straight grain or what distance to the original under-arm point it should be made. Either of which would have been very helpful to get the right placement. It only tells you that the sleeve hem is 21 cm wide on each pattern piece... And it does mention shoulder/sleeve length but not the length of the body of the cape. Also, the text about what looks, at first glance like sleeves is not entirely clear either. They mention a slit between body and sleeve but don't really go on about the sleeves themselves. Edges at those 'sleeve-slits'. Do they mean they're not sewn together? Or only at the very tip? That sort of defeats the purpose of including something sleeve-like, doesn't it? 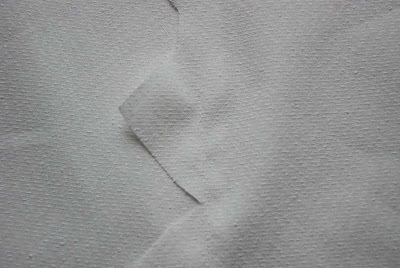 I did stitch the slits on my muslin as sleeves. On one side, I also added a sort of underarm gore: a strip of fabric 5 cm wide between the front and back of the cape. At the other side, I just sewed front and back together. Even when posing like the lady in the drawing, I fortunately don't look like I don't have shoulders at all. The fabric I used for the muslin is a bit stiff, so I expect the cape to drape more gently when made up in an actual fashion fabric. Oh, and the fabric tends to stick to the fabric of my jumpsuit, which makes the 'normal view particularly un-appealing. In these pictures from the side, you can more or less see what I'm talking about with that underarm gore. Basically, it allows that half-sleeve thing to function like a real sleeve. 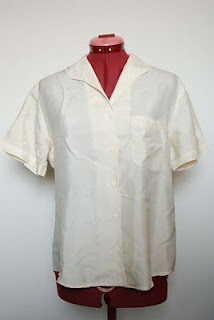 Do you sew practical clothes or this which are fun/challenging to make? Sometimes one has to be practical though. Especially if it actually requires fairly little effort. And resques a well-loved item of clothing. Resques? Yes. Like many other people who sew, I usually prefer to make something new rather than mend. But that is a bit of a waste, so, once in a while I do it anyway. This time it was this shirt. It's vintage, I don't really know how old. It's a simple thing and I bought it very cheaply but it's 100% silk which makes it really nice to wear. But, recently, it developed a tear in the fabric just under the left sleeve. I think the fabric had just become too thin there because the shirt was so wide on me that I doubt I even put stress on that area. Because it was so wide to begin with, I could do this. However, I couldn't just take the thing in normally at the side seam because the tear went on for about 7 cm into the front piece. So, I improvised and moved the side seam towards the front. So, I kept the full width at the back but cut off the entire damaged area (and the corresponding bit at the other side) at the front. P.S. 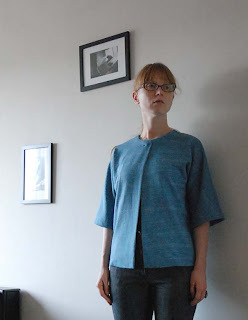 Several asked about the skirt shown in the blue cardigan post. Of course I made that too, it was over a year ago and I blogged about it here. What do you think of capes? I'm having some trouble deciding what to make this week. Dutch spring weather is unreliable at the best of times. We've had some nice days but today, it was gray and cold-ish once more... And there's no telling what next week or even next month will be like. Of course, I don't have to be able to wear anything I make straight away, but still, I like to. Mind you, I have owned a cape before. It was black, almost floor length and made of crushed velvet. In my goth days, I loved it but now, I'm thinking about something different altogether. A cute little one, in colour. More like something Joan or Peggy would wear. This is booklet number 5 (I found 1 through 6) of an 'easy drafting' series from the 1960's. The fact that they're numbered suggests that no. 1 really was the first issue and 'everything so far' is listed in no. 6 which sort of suggests that this was a short-lived experiment. The subscribtion used to come with a set of sized slopers which, obviously, wasn't sold alongside these booklets (I saw a set of sized slopers for sale recently but those were from a later date and produced by a different company. So, I didn't think they'd be a match and didn't bid). That is a shame but I think I can work around that and just use my own slopers. I'm not sure about those pockets but having sleeves, no matter how short and wide, could make this a little more practical. 1. No matter how cute or period-accurate these two capes are, aren't they just a bit too costume-y for 2012? And 2. Are capes ever any use in real life? I know they won't exactly keep me warm while cycling, but in order to be any good to me, they'd at least have to do a half-way decent job when I'm walking around outside. Oh, and a non-official question no. 3: which one do you like best? That's what I keep thinking when looking at this fabric. And, quite appropriately, we've had some very nice clear mornings, followed by dreary, cloudy, rainy afternoons this week. So, perfect time to introduce an easy, throw-over kind of cardi in this great colour into my wardrobe. It wasn't warmly received in my previous post and I get that. A blocky top. 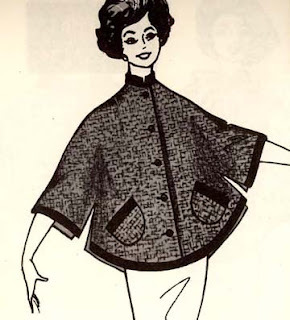 Don't the pattern companies throw enough sack patterns our way already? Well, I guess they do. As you know, I'm no expert. However, I do know that with loosely fitted garments, it's all about amount and proportion. 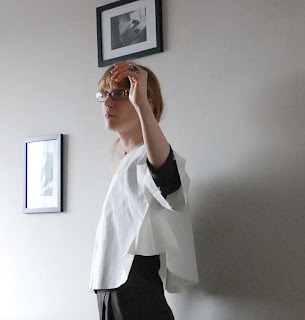 You need to find the perfect balance between free-flowing fabric and showing some of the body underneath. It can be hit-and-miss, but it's quite do-able in a drapey knit. This particular fabric is fairly thick but has a nice hand. I designed it to be worn either loose or belted (although belts are always tricky for me. I love them on already fitted dresses, but I'm always hesitant about the cinched-with-a-belt look) and there are no closures. I think I may have to buy something like a little brooch, because I do like having the option of closing it in different places without having buttons or snaps on display when I wear it some other way. I like how the proportions of this thing lend themselves to different, sometimes vaguely vintage-y looks. P.S. Carolyn recently posted about how annoying the word-recognition gizmo can be, and how it discourages her from commenting. As an experiment, I've just turned mine off. Obviously, I hope to encourage commenting here. I'll wait and see if the spam-bots find me again. Also, my email adress is now in the sidebar. This is what I'm making from the blue knit I showed you earlier: a very simple, quite literally T-shaped, cardigan. 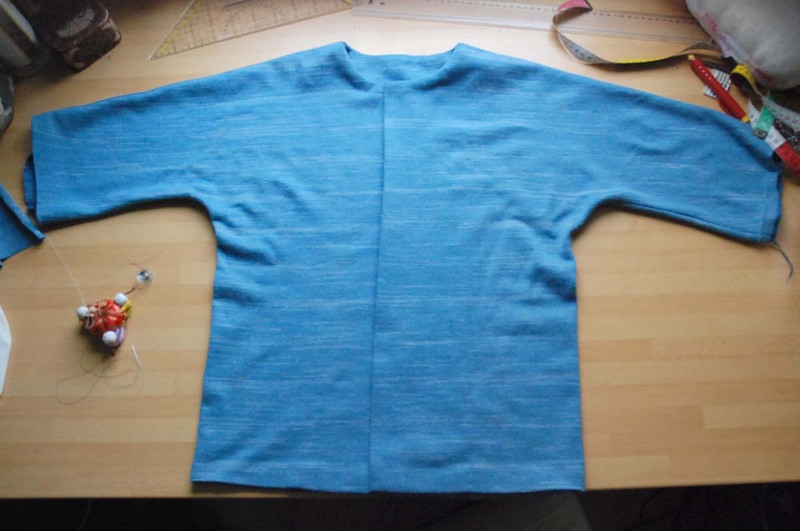 It is the shape I first made for my colour block top, almost a year ago. 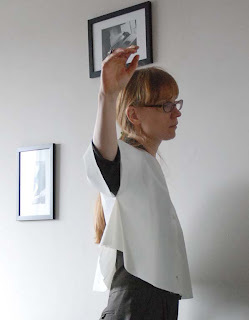 For this incarnation, I made the body 1 cm wider (it's more of a layering piece, after all) and lenghtened the sleeves. And obviously, I made it with a basic round neckline and an open front which extends 2 cm past the center front line. I think I'll be able to finish it tonight but I won't get to take pictures of me wearing it until Thursday. Yeah, you all know that. What else is new? In relation to that, I'm also addicted to buying fabric. Especially if it's of good quality and cheap. So, I couldn't resist when the sale on wool fabrics was still on the next time I went to the market. the 3 meters I bought. All of this, though maybe a bit excessive, isn't really anything new. 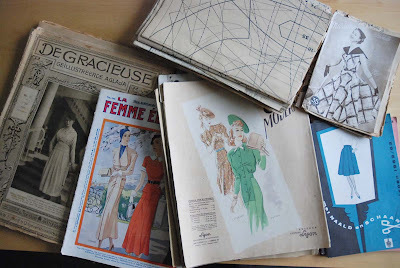 Of course, I bought those Marions before but now,collecting vintage patterns and their magazines seems to be developing into an obsession in its own right. I've collected pattern magazines with patterns, without patterns and even some pattern sheets without magazines. I've mostly bought this stuff in groups and each is worth its own show-and-tell post. The oldest one I've got is the Dutch magazine 'Aglaja' on the left which is form 1918. I found two issues, one of which still has it pattern supplement. Then, the mixed batch of French, Dutch and German magazines and pattern sheets next to it (bought by me as one lot) dates from the 1930's and 40's and then there are my Marions from the 50's, 60's and 70's and those little coloured books which are part of a 'simple drafting' series from the mid-1960's. Anyway, I'll pick some out to show to you in detail later. Did I tell you about the 1912 project before? I think I did, but just in case you missed that: the 1912 project is a great initiative by the lovely ladies behind popular vintage pattern resource the vintage pattern lending library. 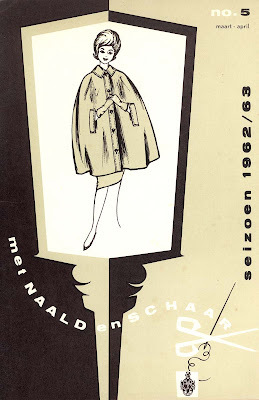 Because this year, 2012, marks the 100th anniversary of the sinking of the Titanic, they've set out to digitalize all the patterns from the 1912 issues of La Mode Illustree, an important French fashion and sewing magazine of the time. Although I don't do a lot of historical costumes, I'm a sucker for history, interesting patterns and of course any combination of the two. So, I signed up as a test seamstress. Today, I can show you my first project. This skirt. I merely made a muslin, so don't get too exited. I will basically do fairly complete muslins (so, including things like facings. not the rough and ready 'just check the overall shape' things I sometimes make) of all patterns I receive and only make a chosen few into actual finished garments. back on those and the patterns themselves. Personally, I was curious about the dimensions of the garment. The drawing shows quite a curved back so it would be interesting to see whether this pattern was in fact drafted for a lady with a posture shaped by early 20th century corsetry. And talking of that, what would the waist-to-hip ratio be like? I opted to receive the pattern as a PDF. It worked fine apart from the fact that I couldn't open the pattern on my older Apple computer. Fortunately, there were no such issues on my boyfriend's PC and I could print the pattern just fine from there. It was a bit harder to assemble than Burdastyle's PDF patterns. Those have clearly marked boxes on each A4 on which the pattern is printed, all of which are smaller than the printable area. And points-to-match at each side. In this pattern, they've clearly tried to use as much as possible of the paper avaible. 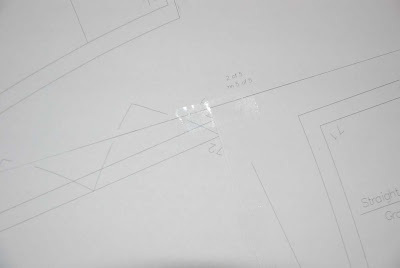 Although a good idea, this placed the edges of the print just outside the printable area on the printer I used (my new printer has just arrived, so I'll see how that copes with the next project) which made matching the edges difficult. When cutting the skirt, some little things caught my attention. 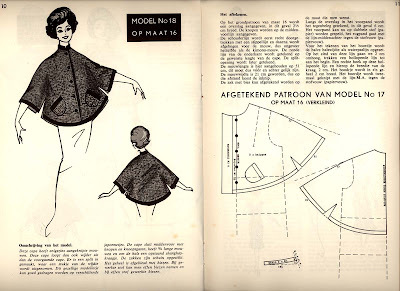 First of all, seam allowance is included in the pattern, however at the scalloped edge, there was no seam allowance. Secondly, at the bottom, all pattern pieces were straight or even got longer towards the sides. In a flared skirt like this, I would expect the hemlines to be slightly rounded, being a bit shorter at the sides. And third, there was a line with the text 'natural waistline' 5 cm below what was going to be the top of the finished skirt. I itself that's fine. I've made plenty of high-waisted faced skirts myself. However, this skirt got narrower between that line and the actual top of the pattern, which I think is odd. After all, the waist is usually the narrowest point on the torso. Then, you had to turn in the inner edge of the facing and slipstitch it to the inside of the skirt piece. After that, it's not discussed anymore. To attach the scalloped left front to the center front piece (and I read these instructions several times, just to be sure) I think you're just supposed to do this: lay the left front on top of the center front and topstitch. It's hard to see in the picture, but there's a line of stitching just on the inside of the right corners of the scallops. If I were to make a 'real' version of this skirt, I think I would add seam allowance to the scallops on both skirt piece and facing and apply the facing in the normal way (just because I'm not a huge fan of trim), keeping it free at top and bottom. Then, I would sew the facing to the center front. Later, the waistband facing can be attached to the top of the front facing and the decorative buttons through the scallops will secure the left front skirt itself onto the center front. For the rest, construction is pretty straight-forward. You sew the other skirt seams, and the vertical seams on the facing. Then you sew the facing to the top of the skirt, matching at all the seams. It is only at that left front where the two facings should meet that no mention is made of how to deal with that. As mentioned above, I would recommend not stitching the inside of the front facing down as a first step, so that you can sew the top of it to the waistband facing now and then sew the lot to the top of the skirt in one go. Then, you only have hemming left. 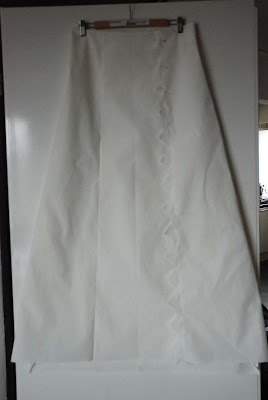 I didn't hem my muslin and I hope you can see my issues with it. At the bottom, the skirt pieces don't quite match each other, and there's a bit of that shape issue I mentioned above. Only 1 cm was included for the hem and that is how I cut it. That makes it a full length skirt for me (I'm 1,68 which is a fairly average height, at least according to Burda), so to hem it nicely, I would need to cut it a bit longer. And now, just for fun, here are some pictures of me wearing the skirt. The pattern is for a 35 inch waist, which is a lot bigger than mine. I just kept the side you don't see in the picture pinned together. So, this doesn't say much about the fit (I did some measurements though and the waist-to-hip ratio actually seems to be shy of 2 to 3, so this is not for a corsetted lady. The demoiselles of 1912 where definately moving with the times). It does, however, show that it wasn't made for someone with a significantly different posture. P.S. This may read as a lot of criticism but I have mentioned each and every little issue I found. Some of them may be idiosyncracies of early 20th centure sewing technique, others might be oversights or errors in translation. 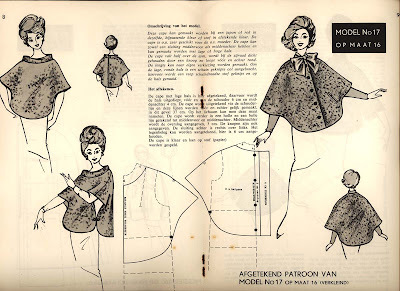 The bottom line is: I really respect the ladies of the vintage pattern lending library for taking on this project and I hope to help them make it as good as it can be. And I think it's great they make it possible for all of us to use real antique patterns. P.P.S I've assumed that 'left side skirt' ment left side for the wearer... looking at the drawing it seems like the scallops there are coming from the left side for the viewer... the right side of the wearer! Which would be in line with the rule of 'right over left' for ladies' clothes, which I blogged about here and here.